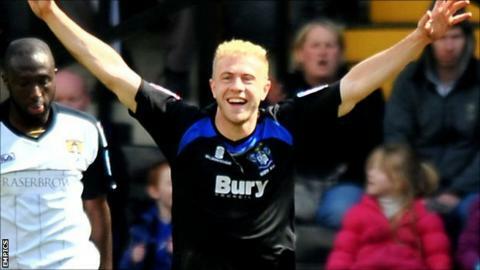 Manager Alan Knill has said free agent striker Mike Grella has been offered a deal at Scunthorpe United, following his exit from Bury this summer. The 25-year-old American scored four goals in 10 games for the Shakers last season following his switch from Brentford in February. "We have sent it [the offer] through in writing," Knill told the club website. "I have to say Mike hasn't just got our offer on the table, there are others too." "Without a doubt some of those offers will be more than we have offered, but he will have to make that decision." Leeds brought the New York-born forward to the Football League in January 2009 and since leaving Elland Road Grella played for Carlisle United, Swindon Town and Brentford prior to his move to Bury. "He is the sort of player that I like as well, pretty technical," Knill continued. "People could look at him and say that he hasn't done this or that, but we are hoping that we can bring what is in there out of him. "If he does come to us it will be for the right reasons; that he thinks that we can make him a better player."